If you can improve your race results without buying new equipment or training more, where would you start? You might look at your mental approach to racing—how your mental game helps or sabotages your success. Do you understand how your mental game is slowing you down in races? The attitudes, beliefs, and mindsets that runners, cyclists, triathletes and endurance athletes take into a race dictate their performance success. The first step to improve your mental approach to racing is to understand how you might sabotage your success with doubt, high expectations, perfectionism and other mental game roadblocks. Here, you’ll learn about the top-six costly mistakes races make with their pre-race mental approach. Despite what others have taught you about positive expectations, maintaining high outcome expectations can actually limit your success in racing. Why do high expectations limit you? If you don’t achieve your pre-race expectations during the race, you’ll start to doubt yourself or become frustrated. Essentially, expectations set you up for failure before you even start the race. In addition, expectations are usually about outcomes, such as achieving a personal statistic, placing high or winning. Athletes judge their performance in each discipline based on their expectations. In most cases, expectations cause competitors to focus on outcomes and feel more pressure to perform at their peak, which can turn into pre-race anxiety or worry. Self-confidence is an athlete’s best friend. If you have a high level of belief in your ability, it’s hard to feel anxious. Unfortunately, many competitors leave their confidence to chance. This means they fail to take full responsibility for feeling confident at the start of the race. Do you wait to feel confident in your skills only when you have a good start to the race? If so, you leave confidence to chance or immediate results. Are you unsure how you will perform before a race? Do you doubt your ability to finish strong? Your main objective is to be proactive with your pre-race confidence. You don’t want confidence to be thrashed around by immediate results at the start of the race or a particular discipline. You want to fuel your confidence—just like your fuel your body—before the start, not react to what’s happening early in the competition. Your pre-race worry, anxiety or tension can come from several sources depending on your unique disposition. Most athletes worry too much about outcomes, results, making mistakes during a race or where they think they should finish compared to other people. Fear of failure is the number one reason why athletes don’t perform as well in races as they do in everyday training. Most of the time, fear of failure is rooted in two areas: (1) social approval or worrying about what others think and (2) the payoff syndrome or worrying that all the hard work you do to succeed might not payoff. You must understand your underlying fear so you can overcome this form of self-sabotage. 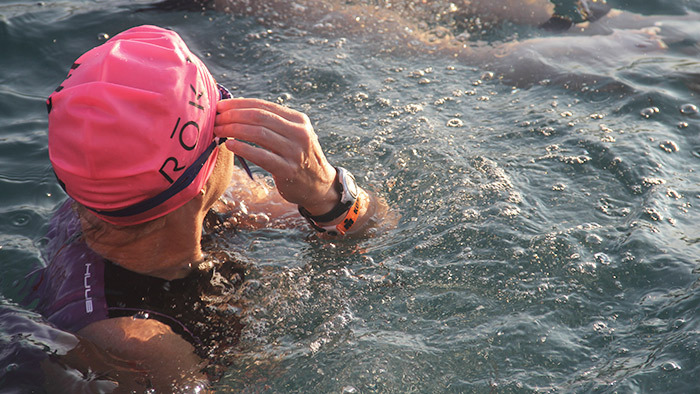 Every triathlete, runner or cyclist experiences pre-race jitters. These are the feelings of excitement prior to the start of a race. However, some athletes turn pre-race jitters into performance anxiety. And performance anxiety will slow you down because you can’t trust in your plan or skills. Pre-race jitters are a natural part of your racing, but pregame performance anxiety will cause most athletes to tense up, worry about their performance and ultimately not perform up to their ability. Experienced athletes welcome pre-race jitters. Positive pre-race jitters help instill an optimal level of mental activation or excitement, which can boost focus. Your ability to embrace pre-race jitter is critical to having a good start and consistent performance. Many athletes will interpret pre-race jitters as anxiety, which causes them to become stressed or anxious and thus focus on the wrong performance cues. For many triathletes, runners and cyclists, a big source of pre-race worry about performance comes from social approval or the need to have others “approve” of their performance. If this is you, you might feel the need to be admired, accepted, respected, or liked by fellow competitors, teammates or coaches. This leads many athletes to worry about performing poorly and avoiding mistakes because they think the outcome influences what others think might about them. Thus, if you crave approval from others such as teammates or competitors, you are more likely to become anxious or are afraid to fail in competition. Your need for approval from others supports your fear of failure. Athletes who need others’ approval to feel confident in their skills are prone to pre-race anxiety. Perfectionism can be both an asset and a disadvantage for athletes. Perfectionism can actually slow you down during competition. For example, perfectionist athletes have incredibly high expectations about their performance. They also lack confidence and trust in competition. However, perfectionism can help athletes with practice because they are goal-oriented, committed and strive to improve their skills. How does trying to be perfect slow you down during races? When perfectionists attempt to perform perfectly, they become easily frustrated with mistakes, and are often stuck in a “training mindset” when performing in races. None of these characteristics are ideal to perform your best in races. During the next several weeks, we’ll dive deeper into each of these six areas of mental sabotage so that you can get the right tools you need to break through any mental or performance anxiety barriers you have that might be holding you back. Dr. Patrick Cohn is a master mental game coach with Peak Performance Sports in Orlando, FL. Andre Bekker (pictured here) is a 12-time Age Group winner in Ironman and 70.3 events / former professional bike rider, and owner of 5th Dimension Coaching. Download their free audio program, “Mental Toughness Skills in Racing for Triathletes”.